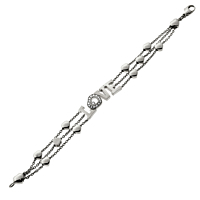 Chopard's white gold love bracelet from their happy diamonds collection is playful and unique. The triple strand jewel is finely crafted in 18k white gold, with solid gold puffed hearts interspersed along the chain. The geometric word love, the center focal point, contains a heart shaped O bezel set with 15 round brilliant cut diamonds.